St James Clinic is owned by Islander Edward Day. Ed is proud to own a successful, reputable clinic and be part of such a fantastic team of dentists, hygienists/therapists and nurses. Ed is a Dental Technician and has been since 2002, over the past 14 years he has spent a lot of time studying as he believes innovation and experience make for a good balance the laboratory he has owned since 2007 is a good example of this. 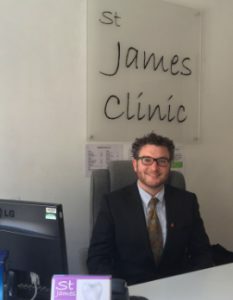 He purchased St James Clinic in 2015 and is always on hand to help regarding any technical work. Aside from the dental world, Ed’s other passions are classic vehicles, sailing and shooting.